Well Cardeno C is an auto-buy for me and I pretty much have determined I’m ok with whatever I’m gonna get with this author. Typically it’s sweet. Typically it’s smutty. Typically I like it. So why read a blurb? Well, May-December romances aren’t really my favorite. And to make matters worse, the whole DILF-to-lover storyline doesn’t ever really work for me. Maybe it’s because none of my friends had hot parents. And maybe it’s because I never stayed in touch with friends’ parents as an adult. But, I just don’t…get it? And that’s my issue, I realize. It just .does.not.compute. on my scale of what I want to read. So Tanner is a 22-yr old diner owner. 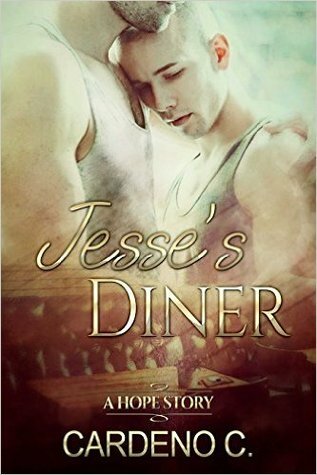 He inherited when Jesse, the father of his childhood best friend, dies. Jesse’s widower is 39-yr old Steve. Tanner has crushed on Steve forever. And that’s the setup. Well…it’s not just the setup. It doesn’t actually go that much deeper or farther than that. Do they get together? Of course they do. Is it the perfect relationship for the rest of time? Of course it is. Are there tiny challenges along the way? Of course there are. But none of it took me any deeper. To be honest, I didn’t buy the attraction. Especially not from Steve’s side. And though I’m told things about both of them, I didn’t feel I knew either of them. And pretty much the first half of this very short book was Tanner acting like a randy teenager lusting over Steve’s every move. Not convincing me that an almost 40 year old man is gonna find some depth in this kid. Thing is…I liked Tanner enough. And I liked Steve enough. And there were some interesting surprises along the way. But, it didn’t all pan out…not in a cohesive way, not in a way that challenged my emotions, and not in a way that will make this memorable for me. This entry was posted on October 5, 2015 by susan in Contemporary, Reviewer: Susan and tagged 3 Stars, cardeno c, may-december romance, the romance authors.